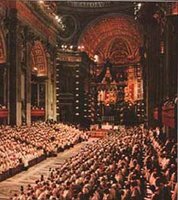 To whatever extent may seem desirable, the hymns are to be restored to their original form, and whatever smacks of mythology or ill accords with Christian piety is to be removed or changed. Also, as occasion may arise, let other selections from the treasury of hymns be incorporated. By “original form,” what would they mean? I’m assuming that hymns were sung in plainsong already, so they might mean texts. “Other selections” seems to indicate hymns from outside the tradition of the Liturgy of the Hours. That could mean pieces used for the Mass. Could it also mean non-Roman sources? Any musicologist out there who knows? This entry was posted in Sacrosanctum Concilium and tagged Liturgy of the Hours. Bookmark the permalink. Well, “hymn” means a text first (a hymn is a specific type or category of sacred poetry/prose) – the melodic setting of the text is a secondary level of meaning. Clearly, they are talking first about the scrubbing of the texts of hymnody free of mythic and anti-pietistic accretions and substitutions. They are also talking of taking hymn texts then not in the Breviary and including them in it. The theme of this, btw, is exactly the reverse of what happened to Conditor/Creator Alme Siderum in the early 1600s after Trent, when a classicist pope changed the traditional text to a more elegant level of Latin. There, the concern was with Latinate beauty, rather than grouding in Christian tradition and piety.